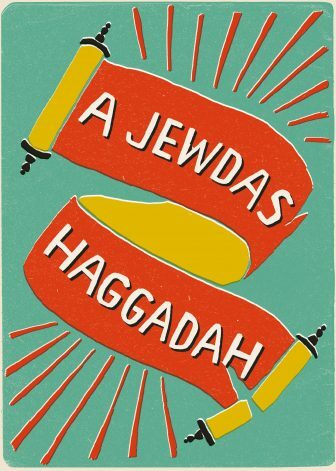 For those looking to imbue their seders with irreverence, radicalism, and comedy, the Jewdas Haggadah has you covered. It feels precarious to give any definitive summary as to exactly who Jewdas is and what they do, as almost every aspect of the group is colored with an incredible air of satire. At its core, though, Jewdas is a far-left Jewish group largely based out of London, whose work tends to focus on anti-zionism, diaspora, and combating antisemitism. Their new haggadah is irreverent, inspiring, and one of the funniest things I’ve ever read. The haggadah centers itself around the “Book of Geoffrey,” an ancient scroll both written and not written by Rabbi Geoffrey Cohen, Jewdas’ collective pseudonym. Geoffrey is defined in this context as “a 44-year-old lesbian mother who lives in a bedsit in Slough,” though it’s made clear that Geoffrey has been a diverse variety of people throughout the entirety of Jewish history. The tone of the book is set right off the bat with a fictional forward, begrudgingly written by the fictional Geoffrey him/her/their self. In the thirty-odd pages of pre-haggadah writing, readers will find satirical letters to and from Benjamin Netanyahu, a coupon for Jewdas’ Antisemitism Screening Service, and some very in-depth instructions on how to be authentically Jewish in late capitalism. The instructions are a mix of genuinely helpful and entirely absurd. You’ll learn everything from how to banish anxiety and the angel of death from your seder (you’ll need a menstrual cup), to how to make a variety of different charosets (you’ll need 100g of existential ennui). And between the comedy and fiction lies a beautiful introduction that sets up the main themes of the project: the power of diaspora, being Jewish in late-stage capitalism, and figuring out how to find joy in a world so deeply stuck in turmoil. Eventually, after scathing bingo cards and earnest poetry, we arrive at the haggadah itself. In a decision I’ve been waiting for years to see, the haggadah fluidly switches between various names and genders for HaShem in its prayers. As open and dedicated as the book is to change, the author(s) do know why some traditions have remained for so long. Summed up well by their discussion as to why the order of the seder remains untouched, “going out of order should be considered in the same way as crossing a picket line… or building settlements beyond the green line.” Every word of this book is as angry as it is loving, as joyous as it is mournful. It never seems to let you sit—or lean, if you will—too comfortably without reminding you of the Occupation, global warming, or some other ongoing disaster. Yet it continually asks you to lean nonetheless. There are poems, illustrations, and songs scattered throughout the book that help blend past and present. It’s exciting and refreshing to see traditional yiddish songs side by side with traditional protest songs, each as revolutionary in tone and history as the last. I can easily say that this is the best haggadah I’ve ever read, though it’s not entirely without fault—and who among us is? The book as a whole has a tendency to fall into inaccessibility. There is a hefty leaning on what seem like Jewdas inside jokes. From satirical meeting notes to one-liners about Sheffield, there’s a lot that can be missed for those not intimately in-the-know. To the authors’ credit, some explanations of jokes and terms can be found in the glossary, and a lot can be well-enough understood through context. I’ve admittedly never been any good at sitting comfortably with not feeling like I know everything about everything—reading this was a great practice in letting go. This haggadah can absolutely be enjoyable regardless of background, but it might be wise to prepare for a wee bit of googling and a decent amount of acceptance that one might not get every joke. Furthermore, those with no yiddish background whatsoever will likely feel lost on more than one occasion. Much of this haggadah felt familiar and comfortable to me, but for whom might it feel alienating? Who isn’t held by yiddish, and yearns to see, for example, casual and comedic Ladino? There is so much this haggadah teaches about diasporic power, but I was left hungry for more of the diasporic experiences that don’t fit as well in the dominant tendencies of Western Jewry. While some non-Ashkenazi traditions are certainly present, there was definitely room for more. I was struck by how much the storytelling portions of this haggadah read exactly like Purim spiels. In Pittsburgh, many of us didn’t have Purim this year. On June 19th, 2018 seventeen-year-old Antwon Rose II was shot in the back and murdered by police officer Michael Rossfeld. On March 23rd, 2019, when many lefty Jews in Pittsburgh were planning on holding a giant purim party, Rossfeld was found not-guilty on all charges. The party was canceled, and instead people took to the streets to mourn and protest. They grieved over the void where life was supposed to be, and demanded the world do better. Similarly in Pittsburgh, many of us did not have Halloween. On October 27th, 2018 Robert Gregory Bowers murdered eleven Jews during their morning prayer. Many lefty Jews were planning on celebrating “secular Purim” together that weekend. The parties were cancelled and instead people took to the streets to mourn and protest. They grieved over the void where life was supposed to be, and demand the world do better. If in the proverbial morning we rise up and continue to fight, there is no wrongdoing in reclining and singing tonight. We don’t even have to close our eyes to injustice in order to bring joy to our seder. In fact, it would be a hollow joy if we did. If you can, mean it and live it when you say “Pesach Sameach!” (Happy Passover) this April 19th. Next year in ha’olam haba. Next year in collective liberation. Ren Finkel is a writer, artist, and soon-to-be rabbinical student living in Pittsburgh, Pennsylvania. Their multi-media work focuses on diaspora, trauma, tradition, and queerness. Drawing parallels between the Exodus story and current political struggles, Jonathan Rosenblum honors striking workers who are standing up to modern-day Pharaohs. 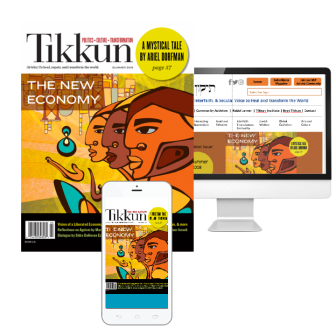 Read our 2019 Liberation Passover Seder Haggadah. In his reading and translation of Rabbi Ya’akov Moshe Charlap, Shaul Magid aruges that the true miracle of the exodus from Egypt is the possibility of revolution.